Kristen was honored, along with Alumnus of the Year Rick Reynolds ’75 and Medallion Award Winners, at the annual Homecoming Luncheon in February 2015. Kristen Eddings Tetteh ’06 is passionate in rallying others to defeat the world’s most pressing health challenges. She has a gift for convincing Seattle’s professional 20- and 30-somethings to support the fight against disease and the spread of best health practices. Through the “Party for the Health of It” events she organized, thousands of people, and tens of thousands of dollars, were invested in lifesaving efforts that include clean water for Tanzania, the defeat of tuberculosis in Haiti, and mobile technology for pregnant women in Southeast Asia. All of those initiatives are based in the state of Washington. 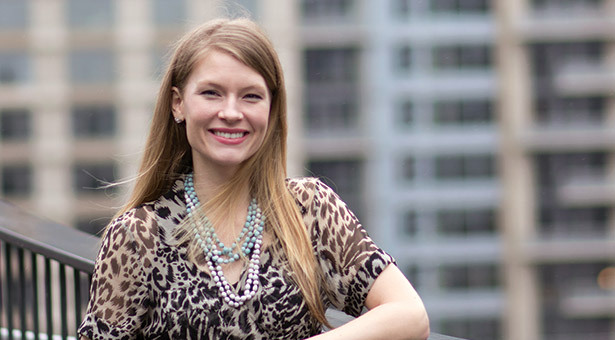 The director of communications at Washington Global Health Alliance, Kristen is Seattle Pacific University’s 2015 Young Alumna of the Year. She and the WGHA team help convene and connect a broad regional and world collective of innovative health leaders such as the Bill & Melinda Gates Foundation, World Vision, Seattle Children’s Research Institute, and UNICEF. More than 60 members strong, WGHA works for global health equity by creating partnerships among businesses, governments, and nonprofits. 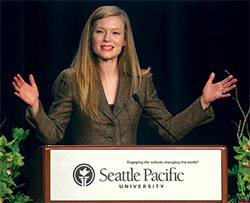 At SPU’s 2014 Downtown Business Breakfast, Kristen was the opening speaker for former U.S. Secretary of State Madeleine Albright. Kristen’s work is as current as today’s headlines. WGHA members, for example, are engaged in malaria and Ebola containment and prevention. WGHA helps publicize their efforts and recruit volunteers for health research. Recently married to Michael Tetteh, a former Seattle Sounders FC midfielder and founder of the One Kingdom foundation, Kristen led Sounders players and managers on a 2013 trip to Tanzania to inspire in them the desire to improve world health. Kristen’s enthusiasm for solving global challenges has provided a number of influential platforms. The international studies major has lobbied the U.S. Congress in support of increased study abroad opportunities and spoke at SPU’s 2014 Downtown Business Breakfast.